PORTLAND, Maine — February 21, 2017 — A new British study published in Nutrients is the first study to show that consuming wild blueberries, a flavonoid-rich food, may significantly boost mood in both young adults and children. The study, led by Professor Claire Williams, from the School of Psychology & Clinical Language Sciences at the University of Reading, is unique among the growing body of research exploring the association between nutrition and mental health. To read the full study visit here. The study, “Effects of Acute Blueberry Flavonoids on Mood in Children and Young Adults,” was conducted in two different populations. Group one consisted of 21 young adults ages 18-21, and group two included 50 children ages 7 to 10. Participants in both groups consumed either a flavonoid-rich wild blueberry beverage or a placebo and were asked to rate their mood on a well-validated Positive and Negative Affect Scale (PANAS), before and two hours after consumption of the drink. In both trials, participants recorded a significant increase in positive mood after drinking the wild blueberry drink. The flavonoid-rich wild blueberry drink was prepared by mixing 30 grams of freeze-dried wild blueberry powder (equivalent to about 1 ¾ cup of frozen wild blueberries) with orange drink and water, creating a beverage that provided 253mg of anthocyanins from the wild blueberries. Anthocyanin is a type of flavonoid that is highly-concentrated in the deep blue pigments of wild blueberries. The placebo and the wild blueberry beverage were matched for levels of glucose and fructose. In 2015, a study led by Professor Claire Williams entitled: “Cognitive Effects Following Acute Wild Blueberry Supplementation on 7 – 10-Year-Old Children” was published in the European Journal of Nutrition. The study revealed that Wild Blueberries boost memory and concentration in elementary school children. 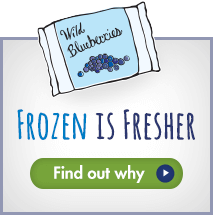 The Wild Blueberry Association of North America (WBANA) is a trade association of farmers and processors of Wild Blueberries from Maine and Canada who are dedicated to bringing the Wild Blueberry health story and unique Wild Advantages to consumers and the trade worldwide. WBANA is dedicated to furthering research that explores the health potential of Wild Blueberries. Every year since 1997, WBANA has hosted the Health Research Summit in Bar Harbor, a worldwide gathering of renowned scientists and researchers whose work is leading the way in learning more and more about the health benefits of Wild Blueberries. Hundreds of studies have been conducted on the potential health and disease fighting benefits of Wild Blueberries. For news, recipes, and related health information about Wild Blueberries, visit www.wildblueberries.com. For the latest updates, read our blog. Visit us on Facebook or on Twitter.